OK, let’s get this out the way right up front. The Tesmo Universe Book is an oddity; in some ways, it’s a great oddity and in others, well, not so much. I’ve had a sample device – and yes, it’s a device – for a couple of weeks now and while I have found myself using it, I’m not sure I’m using it at all in the way the folks behind its Indiegogo campaign envisaged. All that off my chest, let’s move on. So what exactly is the Tesmo Universe Book? That’s the first question I asked because at first blush it isn’t really clear. Upon closer inspection though, it becomes clear that while this is indeed a notebook of sorts, with pages upon pages of planner-like paper with lines, boxes and even cute little faces dotted around, it’s actually quite a bit more than that. Which is great considering the relatively steep asking price. More on that a little later. Without a doubt, the Tesmo Universe Book’s claim to fame is something we haven’t seen before, although there might be a good reason for that. 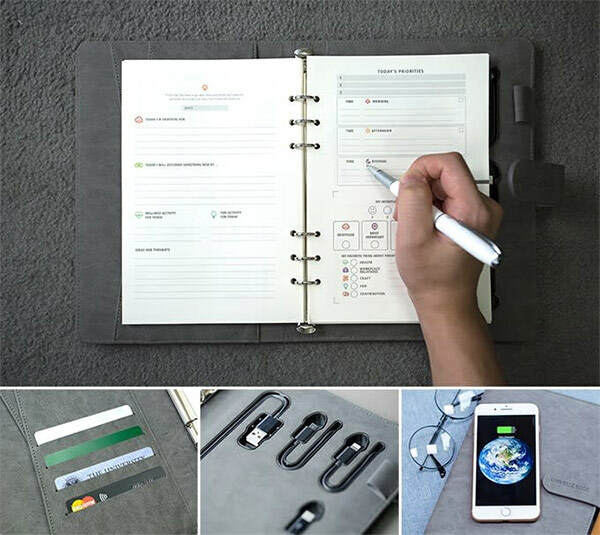 While it’s true this is a planner / notebook, it’s also a wireless charging pad for your iPhone, or indeed any other Qi-compatible smartphone. Slap a smartphone on the Tesmo Universe Book’s front cover and it will magically start charging – 7.5w for an iPhone and 10w for Android devices capable of such speeds. 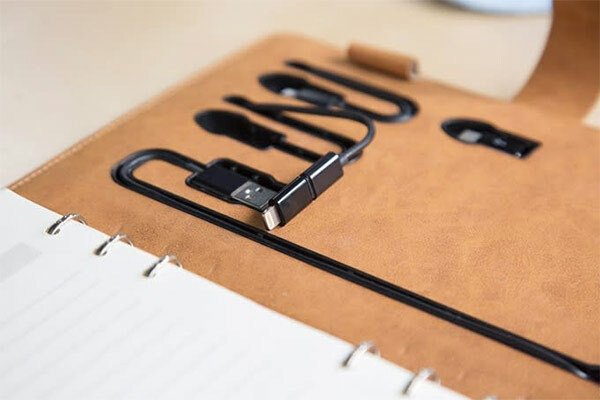 On top of that, you’ll also find one Lightning connector for charging an iPhone or iPad as well as a micro-USB connector for just about anything else. You’ll even find a micro-USB-to-USB-C dongle hidden here so that you can charge any of the new-fangled Android devices that use such a port. Or, perhaps, even one of Apple’s MacBooks – I didn’t have one on hand to test but, theoretically at least, it should work just fine. 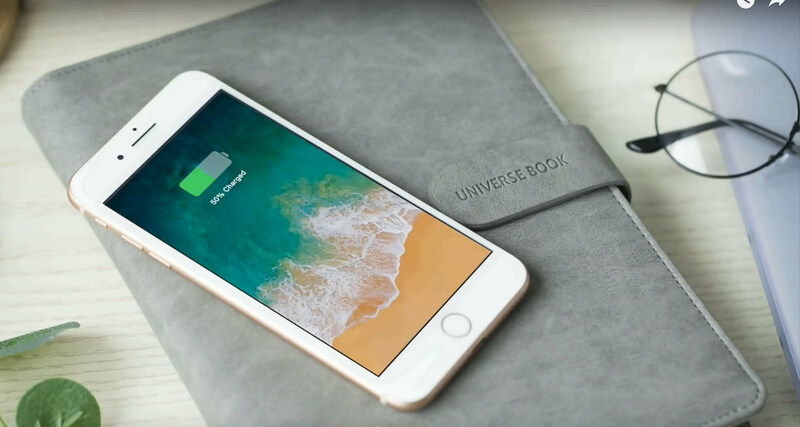 This is all made possible by the built-in 8,000mAh battery which can be fully charged in around four hours and is capable of charging an average smartphone around three times before it itself needs more juice. Overall impression of the Tesmo Universe Book itself is initially good. The quality feels decent enough to be pulled out in a meeting room, although the not inconsiderable number of spelling mistakes in the included planning pages might start to drive you insane if you’re that way inclined. And of course, this all brings us to price. As of writing this review, the Tesmo Universe Book can be backed on Indiegogo for $64 although there are only 26 of those early bird packs available. Once that’s all done and dusted the planner is slated to cost an eye-watering $129 at retail which, in all honesty, I’m not sure I can get behind. As great as being able to charge your smartphone might sound, it’s worth noting that you cannot use the charger and the planner at the same time, so there’s that. 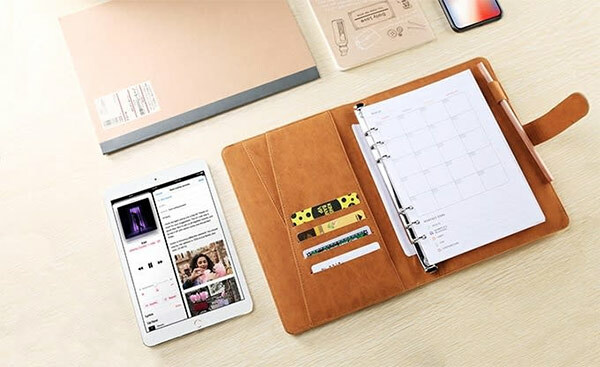 If you planned on being able to charge and work at the same time, then you might be better looking at a solution that involves two things; a conventional wireless charger and a notebook or planner; like the olden days. You can check out the Tesmo Universe Book’s Indiegogo listing right here.